WWI Ship Name Index Return to WWI Auxiliaries. 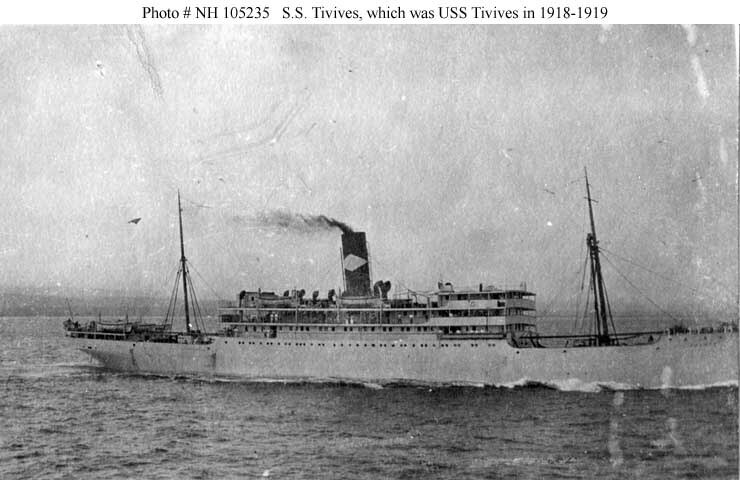 Between its establishment in January 1918 and late 1919 the U.S. Navy's Naval Overseas Transportation Service (NOTS) operated many commissioned cargo ships, primarily to carry supplies to American forces in the European combat zone and then help bring Army supplies and equipment back to the United States. 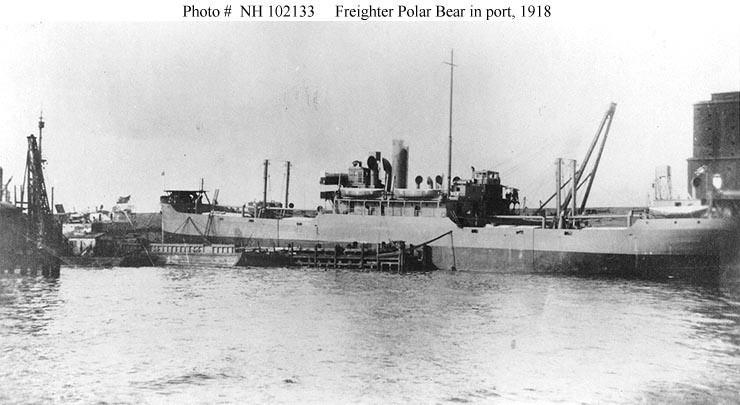 Of these 16 had refrigerated cargo holds and were usually employed in carrying frozen beef to the troops in Europe. In addition to these, a little over a third of the cargo capacity of USS Dochra was refrigerated--this ship is listed with the cargo ships. In 1920 the nomenclature for supply ships was changed to storeships and the designator AF was assigned. All subsequent ships designated AF by the Navy had refrigerated holds. A Note on Sources: The basic source for the cargo ships, including the refrigerated vessels, serving in NOTS is the book by Lewis P. Clephane, History of the Naval Overseas Transportation Service in World War I,, published by the Naval History Division, Washington, D.C., in 1969. Tonnage (in gross tons except for ships built by the Navy) and dimensions were taken from a file of World War I-era ship data cards now in the custody of the Naval Historical Center and from the 1918 and 1919 editions of the Ships Data Book (whose data usually matches that on the cards). Additional information came from the 1918-1919 and 1919-1920 editions of Lloyds Register of Shipping and from the Dictionary of American Naval Fighting Ships. 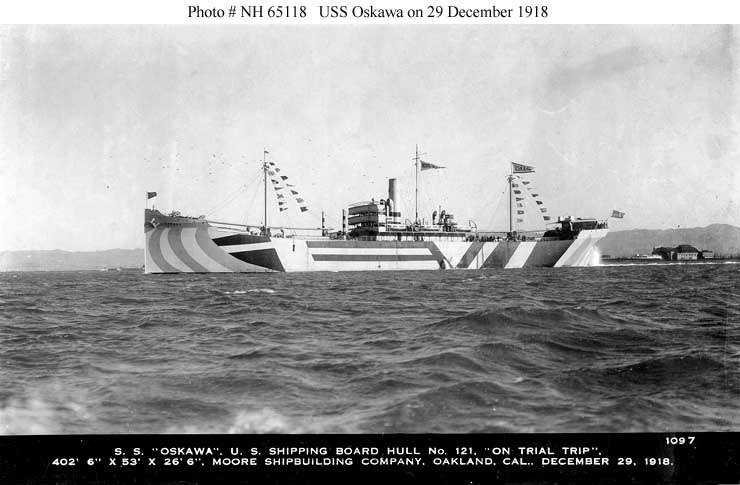 This page features a list of groups of World War I era U.S. Navy supply ships and refrigerated cargo ship, defined by ships' physical characteristics, with links to pages dedicated to each group of ships. Those pages provide further links to the individual ships in each group. Representative photographs are also presented for ship groups and for individual vessels. In the listings below, click the Number (of) Ships entry to access a table of the individual U.S. Navy ships with that specific group's characteristics.